Home / 30hands Getting Started Course & Help Site / 1. Welcome to 30hands! Welcome to the 30hands Learning Community! We believe in the power of getting students to think, create, collaborate and self-initiate learning. Now that you are registered with 30hands, you are ready to easily create great digital stories and presentations and you are on your way to collaborative learning and sharing in a blended e-classroom. We will provide some tips and ideas for getting the most out of 30hands Mobile and 30hands Cloud. In the Fall, we will begin providing some lesson ideas to try out in class. When your students create a digital story or presentation, have them review their work individually and in groups. Then, have them create iterations. This teaches your students that a first draft is just that -- a draft. They will get even more out of the learning experience by reviewing it (analysis), discussing how it can be improved (evaluating) and creating another version (iterative creation). Is the story or presentation too long? Is my voice monotone or does my intonation change? Do I use character voices where appropriate? Can I improve the quality of some of the photos? Would another image be better? Are the slides in the right order? Could I include more slides to better connect the story? Touch a slide and click Delete Slide to remove it. Click here to forward these tips to a friend. 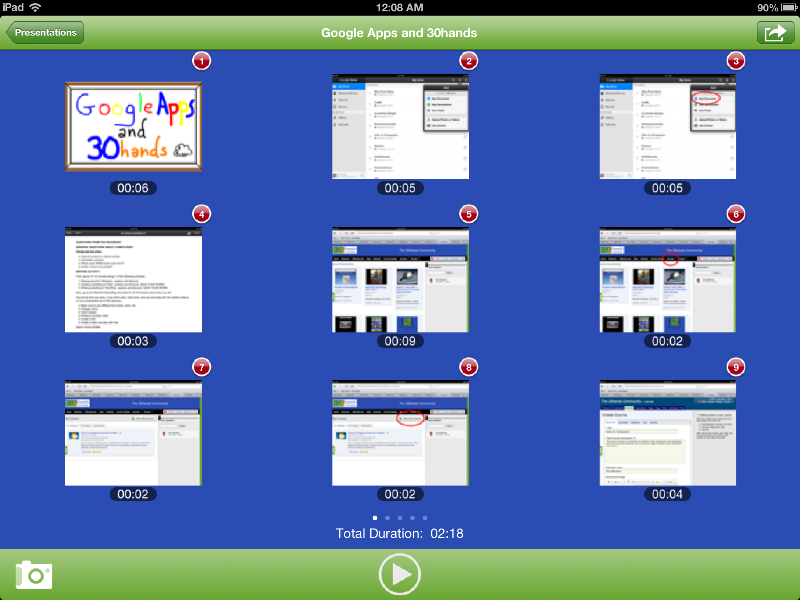 Click here to get more ideas for using 30hands Mobile with Students. Click here to get more ideas for using 30hands Mobile as a Teacher. A slide from theDuck Adventure Story. 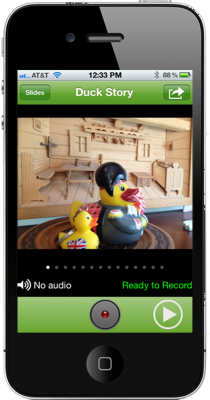 Click the record button to add audio narration and bring the story to life, then publish it to the camera roll or to 30hands. 30hands Mobile desktop showing slides for GoogleApps presentation. We would like to know your thoughts on how you currently use technology or what you are interested in exploring, so we can help you and your colleagues succeed with Blended Learning, Project-based Learning, Flipping the Classroom and Digital Storytelling. If you have time, please send us a note with your success stories. Why does my recording not record. After pushing the record button and stopping the recording, it says no audio and shows no recording? Help please.